DNA is typically found in the familiar double helix, with two complementary strands interacting through base pairing. However, during many genetic processes such as transcription, repair, and recombination, the helix is unwound and the two strands are exposed. This can be a problem. Single strands have a strong tendency to fold up into local double-helical structures such as hairpins, which can inhibit these processes. Also, single DNA strands are more prone to damage by chemicals or nucleolytic enzymes. So, all known cells build specific proteins that bind to DNA single strands and protect them. PSI researchers at NESG have recently discovered a new single-stranded DNA binding protein (SSB) in the bacterium Lactococcus lactis, an important industrial bacterium used in dairy fermentations. A domain from the protein YdbC was identified as an interesting target for structural genomics, and through a series of biochemical studies, it was found that it has strong, but nonspecific, affinity for single-stranded DNA, as well as weaker affinity for RNA. Attempts to crystallize the protein with single-stranded DNA have not yet been successful, but the structures of the domain alone (PDB entry 2ltd) and its complex with two short pieces of DNA (PDB entry 2ltt, shown here with DNA in orange) were determined using isotope-filtered NMR methods. The structures showed a surprising difference from the typical protein fold used to bind single DNA strands. Most single-stranded DNA binding proteins are folded with a distinctive topology, known as the OB (oligosaccharide/oligonucleotide-binding) domain. This domain forms a groove that surrounds the DNA, and is also important for oligomerization of the protein. For instance, the SSB from Escherichia coli, shown here at the bottom (PDB entry 1eyg), is composed of four protein chains, each folding into an OB domain. The single-stranded DNA wraps around the outside of the complex. The SSB in our own cells, known as replication protein A (RPA), has similar OB domains but is formed of three chains. Compare this to the YdbC DNA-binding domain, shown here at the top, which has an entirely different protein topology and is composed of two protein chains. Looking at SSB proteins from many different organisms, we find that the DNA-binding structures are quite similar, most often forming an OB domain, but the amino acid sequences are very divergent. A similar observation was made with the fold of YdbC. Looking in the PDB, there are two other proteins with similar folds: human positive cofactor 4 (PDB entry 2c62) and Pur-alpha from fruit flies (PDB entry 3k44). However, they have very little amino acid sequence homology, so the evolutionary connection between the bacterial and the eukaryotic proteins were not apparent until the structures were solved. Single-stranded DNA-binding proteins bind very tightly to DNA, but with very little specificity for particular nucleotide sequences. They accomplish this by interacting strongly with the DNA backbone, through hydrogen bonds with the phosphates and riboses and complementary charge interactions with the phosphates. They also have chemically generic pockets, often lined with aromatic or hydrophobic amino acids, that surround the DNA bases but don't form specific contacts with the base-pairing surfaces. To take a closer look at these interactions in YdbC, the JSmol tab below displays an interactive JSmol. 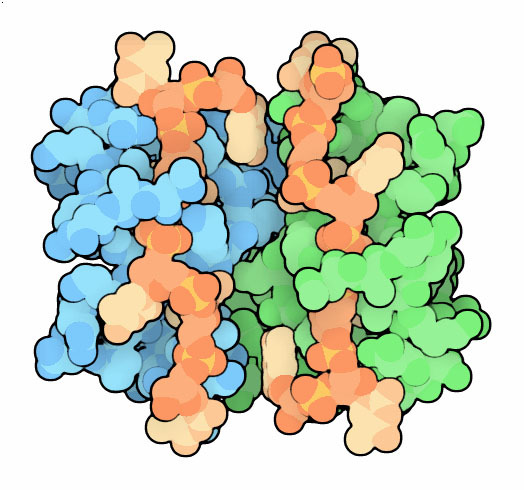 This structure includes two protein chains (blue and green) each bound to a short single DNA strand (red). Use the buttons to highlight the positively-charged amino acids and notice their interaction with the DNA phosphates, and to highlight the aromatic and hydrophobic amino acids and notice how they form pockets for the bases. Rossi, P. et al. Structures of apo- and ssDNA-bound YdbC from Lactococcus lactis uncover the function of protein domain family DUF2128 and expand the single-stranded DNA-binding domain proteome. Nucl. Acids Res. 41, 2756-2768 (2013). Marceau, A. H. Functions of Single-strand DNA-binding proteins in DNA replication, recombination, and repair. Meth. Mol. Biol. 922, 1-21 (2012). Raghunathan, S., Kozlov, A. G., Lohman, T. M. & Waksman, G. Structure of the DNA binding domain of E. coli SSB bound to ssDNA. Nat. Struct. Biol. 7, 648-652 (2000).